Happy New Year! I know it has been awhile since we have updated you on Lana, but time sure flies, as I am sure you know. Lana is growing up and becoming quite the little lady. We have adjusted well to her and she has adjusted well to us. Her favorite toy continues to be her stuffed frog which she loves to fetch, chase and play hide and seek with. She also loves to foot wrestle… that is playfully wrestle our feet with her front paws. She attended puppy class and is doing well with sit, wait and down commands…we are still working on waiting at the front door as she just gets so excited to take walks outside when the weather allows it. She loved playing in the snow! She loves to cuddle, get belly rubs, and to get brushed and groomed by daddy. 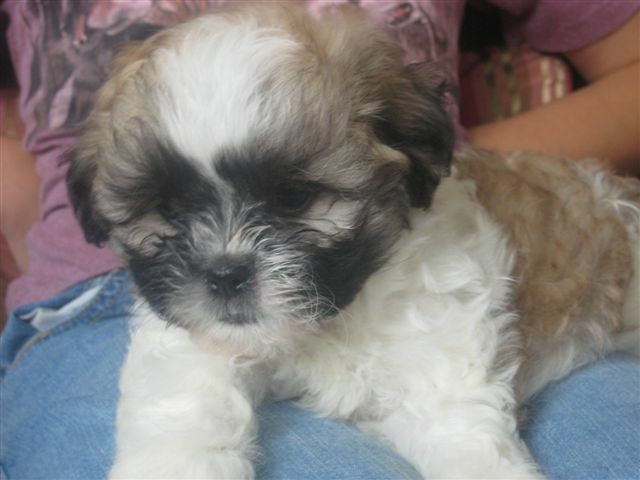 We check your site often and enjoy watching the new litters of puppies grow…they are soooo cute.